It is my privilege and great honor to have been selected as a Bronze Prize winner in the Cabochon Category in the Fire Mountain Gems and Beads 2008 Annual Beading Contest. My inspiration for this design came from my mother's flower garden in my hometown in Indonesia. These memories inspired me to create a few of my coordinated pieces. My mother taught me how to sew and how to prepare clothing patterns, as well as how to embroider. I used these skills to create the neckline of this necklace. The sewing skills were helpful in creating the inner edge of the collar. I began this piece by cutting out the pattern and tracing it on a sheet of Lacy's Stiff Stuff. I secured the cabochons with glue (E-6000) and then drew the flowers with a light color marker. I finished the embroidery with beaded backstitch, then cut around my design and used craft fabric material to complete the backside. I found this craft fabric material to be more comfortable to wear than ultra suede, especially in hot weather. I used glass seed beads # 11/0, 15/0, cultured freshwater pearls, gemstone cabochons, Swarovski crystal beads, faceted amethyst, amethyst rondelles, Lacy's Stiff Stuff and craft fabric. I was born and raised in Indonesia. I'm a New York resident, married with two children. 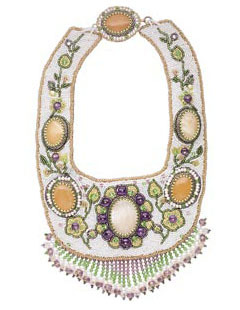 It was around 1996 when I realized how much I love to bead. I have been exploring this beautiful world ever since. My path of learning to bead began with my mother. She gave me the desire to create and the ability to enjoy my own creativity. I first learned from a pattern of beaded earrings and a bracelet, using Czech seed beads, bugle glass beads and Nymo thread. Eager to go where my imagination leads me, I developed my beading skills, overcoming technical difficulties by finding my own solutions. My designs are in a continuous transition process. I am constantly developing combinations of techniques and finding new ways to put my designs together. Each new design is a challenge. I adjust the techniques in order to achieve the final design rather than change the design to fit standard techniques. My favorite materials to work with are glass seed beads, Power Pro™ and FireLine® thread. These materials allow me to create designs in many different ways. I'm very particular in using only good quality materials. I show my work at selective art and craft shows. 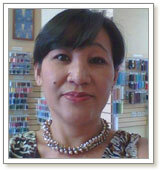 I teach beginners and advanced students in New York in my own workshop, as well as in a bead shop. I also teach groups around my area. I love to share my designs and passion for art with my students. I prepare the instructions myself, working with my students individually and encouraging them to use their imagination and artistic talent. I teach them how to combine basic techniques into a beautiful piece of art. I plan to continue creating new designs using new materials, colors and innovative combinations of techniques, in addition to teaching more people, I enjoy helping others to develop their own creativity, giving them happiness and self-respect, which results from self-expression. My work is available on my website, www.sarahtal.com. My family encouraged me to enter the beading contest and I am grateful for their continuous support through all these years. View all of Lenny's designs in the Gallery of Designs.